My boy said to me last night to make a special bento because he would miss us when we were away in Singapore tomorrow and Friday. I said how about airplane but he said no. 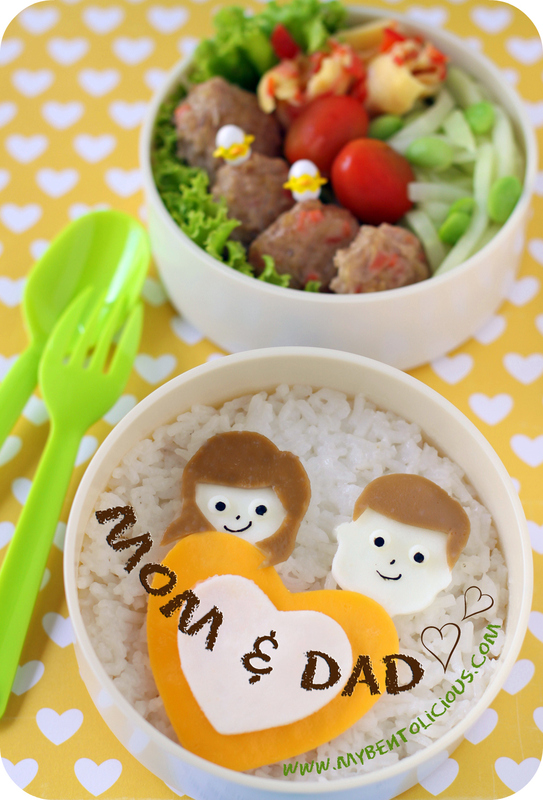 So I made mom and dad characters with a big heart for today's bento. Hope he can feel our love through this bento. I also made his favorite steamed meat balls from ground turkey, diced carrot and glass noodle. Added stir-fried chayote & edamame, omelet with red paprika, and cherry tomatoes. I know that cherry tomato isn't his favorite but I'm still trying to put that for his bento. Stubborn mom LOL :D I hope I can manage to get online from Singapore to see all of your beautiful bento. But as for me, this bento is the last one for this week. Sorry for being so unproductive this week. Happy bentoing everyone! aww.. i bet you will miss them too.. So cute! Have a fun trip! I love that! What a sweet heart he has. This lovely bento will surely warm his heart while he awaits your return. Hope you have a great trip! @Christine Wu : Thanks a lot Christine! This is the sweetest bento ever! Lil' A surely feels comforted and loved with this meal you prepared him ^_^. Hope you will have a great time in Singapore! @karaimame : Thanks a lot Lilian! Bento with lots of love! Beautiful! But Singapore is not that far away...So it's not that bad you can tell them :). By the way, I am not from Singapore - saya juga dr Indonesia sebenernya, tapi skrg tinggal di Jerman ;)! Kenapa banyak yg kirain saya dr Singapore ya, hehe ??? *confused*;). @Quay Po Cooks : Thanks a lot for your sweet comment! Wow, you are here! Welcome to Sg! Aw.. so sweet. I have yet to take a trip away from my girl so it would be *me* missing her more than the other way around. hehe. But a trip adults only is always much needed by parents. Have a super time Lia!! Hi again, Lia, I have an award for you, please pick it up whenever you have the time :). @SIG, @Emily Ng, @Bunda zahraa, @Journal Mommy Yenny, @ChantaleP, @prince n princess mum, @Emily Wong ... Thanks a lot friends for all of your kind and sweet comments!